New Balance 902 wearers, get ready for the next generation. 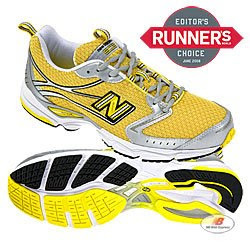 The 903 was just named Runner's World Editor's Choice for June 2008. The combination of a lighter ride and supportive fit make this style a great pick for performance runners looking for more. 28 Grams lighter than its predecessor, the 903 is any runner's dream. An excellent pick for racing or training, the 903 offers some pronation control with the TS2® Transitional Support System; so if you need a little extra support or stability on your feet, you will be covered. If you're in the market to step up from the 902 or just looking for a lightweight, flexible yet supportive running shoe, try on the New Balance 903. And if you've taken a long run in the 903's, let us hear about it. We want to know! The New Balance 903 deserves all the awards possible! Several weeks ago, I purchased the shoe as a replacement for the 826.